I first remember hearing Doolittle from the backseat of my parents’ white Toyota Camry while my sister drove my older brother and me to piano lessons. It was 1992; I was 9 and my siblings were both teenagers. The cassette was loud. Loud enough that I sometimes covered my ears, trying to play it off while nonchalantly leaning my arm against the door handle. I liked the Pixies, but my ears were overly sensitive—and I wasn’t used to music that sounded like this. The three of us had grown up on a musical diet of Mozart, The Beatles, Bach, Tchaikovsky, and classic folk and jazz. Our parents shared great records with us, but it was my older brother and sister who introduced me to the world of rock ’n’ roll made after 1970. 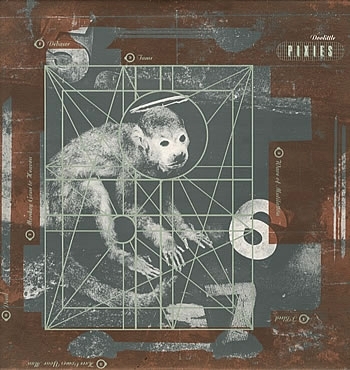 The Pixies released Doolittle in 1989 as their second full-length album—their first, Surfer Rosa, had come out in 1988 but hadn’t sold widely (despite also being stellar). So their second album was our introduction to the band. My older sister first heard the song “Wave of Mutilation” in 1990 when she saw Pump Up the Volume at the local mall. In the movie, Christian Slater plays the UK Surf version of the track on his pirate radio station. Later she bought the tape from a record store and shared it with us, playing it over and over and over. Before access to the Internet, iTunes, or satellite radio, our musical trajectories were not easy or inevitable. Albums were something we listened to together, and this one made an impression. My sister and brother instilled my childhood with other excellent music, like David Bowie, Liz Phair, and Elliott Smith, but Doolittle is the first I remember clearly and an album that still hangs together as a cohesive whole. Since its 15 songs fit into 45 minutes, we could have finished Side A on the drive to our piano lessons and Side B on the way back. Growing up with Doolittle, I wouldn’t have been surprised if Francis had a similar philosophy while writing the lyrics. I often found the words opaque, if not flat-out indecipherable—though I’ve recently found interviews that explain his references to Biblical stories, mythology, and film. But rational explanations aren’t really necessary; whether you understand what the words mean or not, the images they create in your mind are evocative, strange, and memorable. On the second track, the ominous, whispered vocals of “Tame” always leave me intrigued and unsettled. By the time I was listening to Doolittle as a teenager, I realized how sinister the sexual undertones of this song are (which are also prominent at several other points on the album). On “I Bleed,” the tone of the bass guitar is gritty, Santiago’s guitar riffs are piercing and wild, and by the bridge, everyone rocks the hell out. “I Bleed” also provides a prime example of how Deal and Francis’ vocals work together, juxtaposing her high, eerie voice with his rough sing-talking that modulates into shouting. This counterpoint continues to shine on “Silver,” a haunting track with dissonant harmony and a slow tempo. Despite its title, “Wave of Mutilation” is melodic and almost serene, especially when bookended by the more abrasive tracks two and four. (This pattern of melodic / abrasive / melodic songs is consistent throughout the first half of Doolittle.) This contrast between beautiful and harsh, calm and frantic, tender and violent is a key element of why Doolittle works so well. One minute, Francis is shrieking his brains out and conjuring pictures of death and suffering, but the next minute a song launches into a gorgeous, unearthly vocal break. 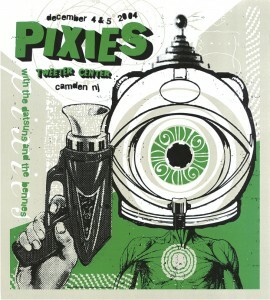 In 2004, I drove four hours to Camden, N.J., with a college boyfriend to see the Pixies on their reunion tour. We stood on tiptoe in a big theater to watch the band play a jam-packed set that included many of the songs from Doolittle. I was ridiculously excited to be there, the next best thing to having a time machine to go back to 1989. They launched quickly from one number to the next without talking much. But after they finished “Wave of Mutilation,” Black Francis turned to Kim Deal and said something like, “Were you playing that in F sharp?” “Yeah,” she said. “It’s in F,” he said. Without hesitation, they started the song all over again, so we got to hear it twice. 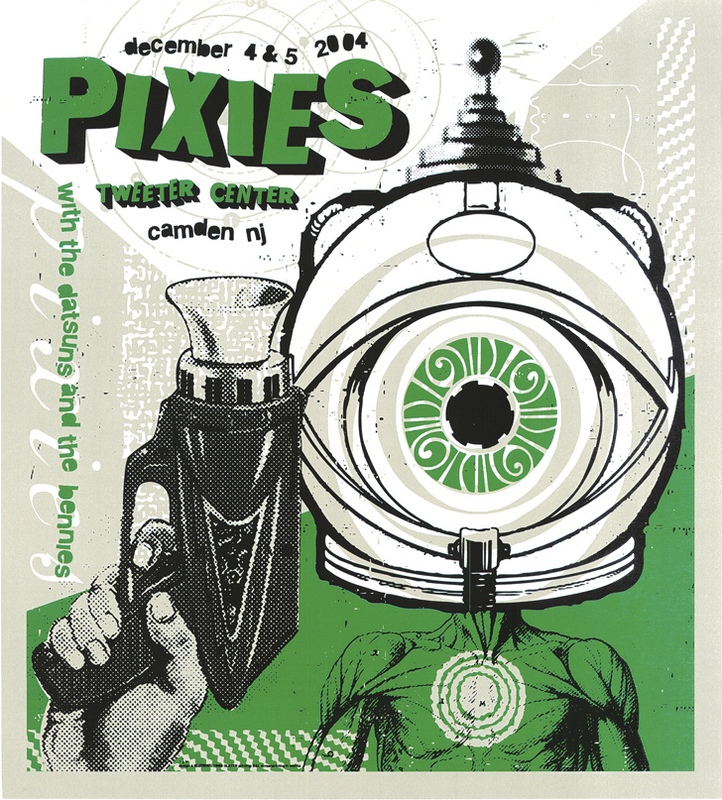 Although the members of the Pixies are talented musicians, there’s often an edge of roughness or chaos in their music, and seeing that on stage made me love them more. I don’t get the sense that they’re too concerned with being perfect. “Here Comes Your Man” is another of the album’s more melodic and warm songs, despite being about deadly earthquakes. It also features effective solos by Santiago and backup vocals by Deal. Earlier in college, I had learned “Here Comes Your Man” on guitar and performed it in our school’s annual drag pageant. I don’t think I was the greatest drag king, but I wrapped an Ace bandage around my chest, put on my army green jacket, and did my best. The lyrics of the chorus seemed appropriate. Though I later read that the song is actually about earthquakes, it still reminds me of drag pageants. According to interviews with the band, “Dead” was based on the Biblical story of Bathsheba, who was married to Uriah. While Uriah was away at war, King David saw Bathsheba bathing, “seduced” her, and got her pregnant. David was afraid of being discovered, so he sent Uriah to the front lines where he was quickly killed in battle. “Crackity Jones” is the most frantic song on the album. It’s less than a minute and a half long, but manages to fit in screeching vocals, a mash-up of Spanish and English words, and whirlwind drums. All the songs on Doolittle are pretty short: “Tame” and “There Goes My Gun” also clock in at less than two minutes, and only “Here Comes Your Man,” “Hey,” and “No. 13 Baby” (another great track where Francis ranges from sing-talking to rambunctious wails) are longer than three minutes. According to “Fool the World: The Oral History of a Band Called Pixies,” producer Gil Norton wanted songs to be longer, but Francis argued with him—pointing out that many of Buddy Holly’s hits were only about two minutes long. Francis has said that “Gouge Away” refers to the Biblical story of Samson and Delilah. The Philistines wanted to defeat Samson, so they paid Delilah to discover the source of Samson’s superhuman strength. She learned the secret and had a servant cut off Samson’s hair while he was sleeping. Then the Philistines were able to capture Samson, blind him, and imprison him. Later, the Philistines brought Samson into a temple where they were holding a religious sacrifice. By this time, Samson’s hair had grown back, restoring his extraordinary strength. He pushed on the pillars of the temple and brought the whole building down—killing everyone inside, including himself. The summer I turned 16, I spent my birthday on Great Fox Island in Virginia, which isn’t so much an island as an old house on stilts in a remote stretch of marshes. Inside, the walls were covered with murals. We jumped into Tangier Sound instead of taking showers, and the bathrooms had composting toilets (which worked well, though they came with a slightly unnerving breeze from below). The house is an environmental educational center run by the Chesapeake Bay Foundation, but that week no one else was there except for two counselors I’d just met. So I was free to play my CD of Doolittle as loud as I wanted. It echoed down the long hallway that channeled the wind off the water. I had brought very little with me besides a few CDs. I ended up wearing someone else’s clothes that were much too big for me, cinching them at the waist with a length of rope. I had a pixie haircut, I was dressed like an awkward pirate, and I hadn’t brushed my teeth in several days. I didn’t care: the house had a boombox, and all was right with the world. I remember the album spinning to the last track, “Gouge Away,” and feeling like I’d never been farther away from civilization. The three of us had been telling time by the sun, swimming in the Sound, and climbing up onto the roof to sit in the crow’s nest. Doolittle was the perfect soundtrack to encapsulate that place—not the album’s violence, but its complete freedom not to owe anything to anyone at all. It’s one of the more accessible songs on Doolittle, though I still think it holds up musically and as part of the whole album. In the context of this dark album, “Hey” is oddly romantic. Although it mentions whores a total of four times, it’s basically a mournful love song. “Been trying to meet you,” Francis sings. “If you go, I will surely die.” It creates a stripped-down sound with minimal bass and guitar in the verses, building up to a fuller arrangement in the chorus. This track is one of my favorites now as I listen to Doolittle on my gleaming silver stereo receiver, a model from the 70s that my dad got from a thrift store in the 90s. The MacBook where I store most of my music will be obsolete in another year, but certain things are made more solidly and are worth holding onto. I wouldn’t be surprised if in another few decades, you can still find me coming back to listen to Doolittle on this stereo. Liz Bergstrom: writer and grad student at Sarah Lawrence College. Overly fond of chana masala, loitering in coffee shops, and singing live rock band karaoke. Check her out on Twitter. Check out more from our Perfect Records series.